Nicole Hayes is an award winning author, podcaster and a writing teacher based in Melbourne, Australia. Her books include Young Adult novels, A Shadow’s Breath, (Penguin Random House, 2017) – shortlisted for the NSW Premier’s Literary Award (2018 – pending), 2018 CBCA Notable book, and longlisted for the Gold INKY Award; One True Thing (Penguin Random House, 2015), winner of the Children’s Peace Literature Award, shortlisted for the 2016 WA Premier’s Literary Award and the YABBA and KOALA awards, and was a 2016 CBCA Notable Book; and The Whole of My World (Penguin Random House 2013), shortlisted for the YABBA and KOALA awards, and longlisted for the Gold INKY. 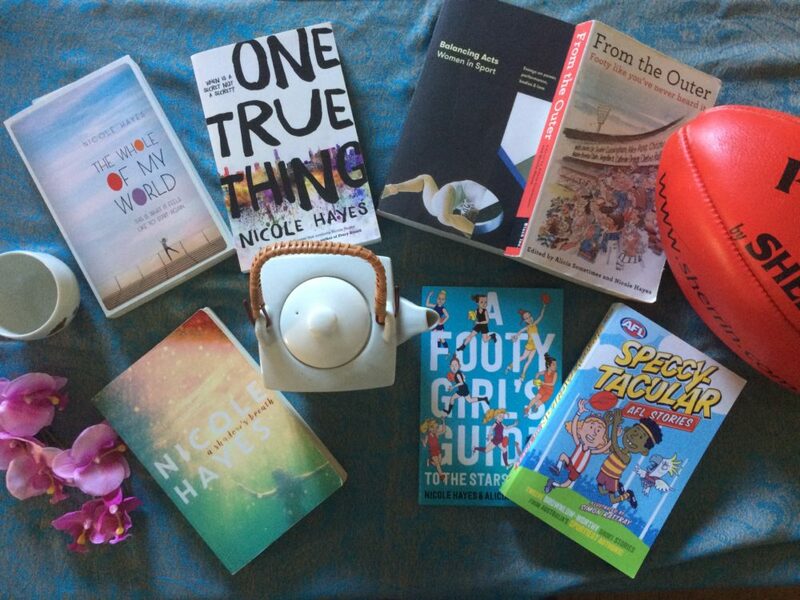 In 2016, Nicole co-edited an anthology of writing, From the Outer: Footy Like You’ve Never Heard It (Black Inc), with Alicia Sometimes, both of whom form part of the groundbreaking all-female Australian football podcast, The Outer Sanctum. The Outer Sanctum was pivotal in breaking the Caroline Wilson / Eddie McGuire controversy in 2016, and after partnering with The Age for the inaugural women’s AFL competition, is now at home at the ABC on Grandstand radio and digital. Nicole and Alicia have also collaborated on a football book for younger readers about the inaugural women’s AFL competition, A Footy Girl’s Guide to the Stars of 2017 (Black Inc, February 2017). In the past few years, she has published pieces in The Guardian (Australia), The Griffith Review, Writers Victoria, NSW Write, Mamamia, The Wheeler Centre online, and has chapters included in Balancing Acts: Women in Sport (The Lifted Brow, tbp 2018); Speccy-tacular AFL Stories (Puffin 2018); From the Outer: Footy like you’ve never heard it (Black Inc). Nicole runs writing workshops for a range of organisations and educational institutes around Australia, including Australian Writers’ Centre, Writers Victoria, and is the Creative Writing Facilitator at Phoenix Park Neighbourhood House. Nicole regularly speaks about writing, sport, politics and gender issues. She has a Master of Arts in Creative Writing, a BA in Politics and Media Studies, and is an ambassador for the Stella Prize in Schools program, and is a passionate #LoveOzYA advocate. To contact Nicole regarding her workshops or teaching, you can find her on Twitter: @nichmelbourne or Facebook: Nicole Hayes (author). To book Nicole for a speaking or public event, contact Booked Out – (03) 9824 0177.